Herod secretly called for the wise men and learned from them the exact time when the star had appeared. Then he sent them to Bethlehem, saying, "Go and search diligently for the child; and when you have found him, bring me word so that I may also go and pay him homage." When they had heard the king, they set out; and there, ahead of them, went the star that they had seen at its rising, until it stopped over the place where the child was. When they saw that the star had stopped, they were overwhelmed with joy. On entering the house, they saw the child with Mary his mother; and they knelt down and paid him homage. 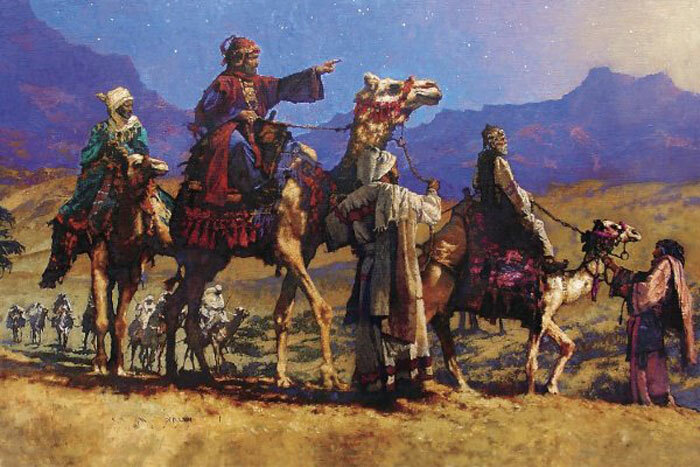 Then, opening their treasure chests, they offered him gifts of gold, frankincense, and myrrh. And having been warned in a dream not to return to Herod, they left for their own country by another path. Come worship with a Service of Lessons and Carols at the Temple in Independence, Missouri, or participate through the live webcast at www.CofChrist.org December 9 at 7:00 p.m. CST. The First Presidency will share in scripture readings and the Spire Chamber Ensemble and the Festival Brass Quintet, with conductor Ben Spalding, will be featured. The Service of Lessons and Carols is a traditional format for Christmas worship that goes back as far as 1880 to the Cathedral of Truro in Cornwall and tells the story of our salvation in Christ. The lessons include nine short Bible readings from Genesis, the prophetic books, and the Gospels. Readings will be interspersed with carols by the congregation and anthems by the choir. Community of Christ celebrates Christmas all around our worldwide church. Enjoy photos of some of those celebrations from tropical villages to dusty deserts to crowded cities in the December Herald and at www.CofChrist.org where we join in remembering diverse celebrations of years past and rejoice as we bask in the unity of Christ’s love and the promise he brings. Tell us how you celebrate. As you enjoy Advent and Christmas this year, capture your memories in photos and send them to us for consideration in next year’s Herald and website feature of “Christmas around the World.” Please include caption information and photographer’s name. Send photos to the Herald@CofChrist.org. Please read the letter from The First Presidency and the official policy, Tithing Policy for Consideration of Priesthood Ordination, effective January 1. These are posted at www.CofChrist.org/policy. Pre-order Community of Christ Sings, our new hymnal, and get a 15 percent discount. Use the order form at www.CofChrist.org/hymnal for bulk congregation, mission center, and campground orders of the pew edition for $19.55 each ($23 after April 30). Individual orders also enjoy the 15 percent discount and can be placed through Herald House: www.HeraldHouse.org, 1-800-767-8181. The 2013 Peace Colloquy gathered hundreds to the Temple in Independence, Missouri, and more joined through the webcast at www.CofChrist.org as Dr. Tadatoshi Akiba was honored October 26 with the Community of Christ International Peace Award for his life’s work advocating for global nuclear disarmament. see President Steve Veazey and Cathi Cackler-Veazey recount their 2011 visit to Hiroshima, Japan. Dates have been announced for upcoming International Youth Forum events. Mark your calendars for USA: July 15–18, 2014; Honduras: summer 2014; Africa: July 15–22, 2015. There is a new video on the Evangelist Facebook page. After launching the page at Spectacular on Graceland University’s campus last July, there have been great responses from visitors. Videos, inspirational messages, information about blessings, and pictures are part of the page aimed at young adults and those interested in finding out more about Evangelist blessings. On November 23 we added a new video that documents the experience of a young adult and an evangelist as they each prepare for the sacrament of blessing. Visit www.facebook.com/CommunityofChristBlessing to view this moving story. The John Whitmer Historical Association requests submissions for possible publication in Restoration Studies. Subtitled “Theology and Culture in the Community of Christ and the Latter Saint Movement,” this collection publishes works that address this broad subject. Writers from seasoned scholars to serious students are invited. The deadline for submitting articles is March 1, 2013. Submissions should be sent electronically to editor@restorationstudies.org from whom guidelines for submissions may be obtained. Christmas cards are being mailed to people in Canada and USA who gave to worldwide ministries in 2012. The card includes the image used on the cover of the December 2012 Herald and thanks contributors for supporting Christ’s mission. Children living in the USA who receive mission tithes offering envelopes will receive a Christmas card from Jack & Jenn. The card includes a nativity scene image and thanks children for sharing their time, treasure, and talent. Children are encouraged to color the nativity scene and submit pictures of their colored images to Jack & Jenn at jackandjenn@CofChrist.org. The Herald commentary series on signal communities continues with “Signal Communities…Pursue Peace on Earth,” by Presiding Evangelist David Brock. It is complemented by a collection of “Journey” stories. When Joseph and Mary took their first steps toward Bethlehem, they started on a journey that changed the world. Now, because of those first steps by Joseph and Mary, people today still are going on journeys. Some are taking inward paths, exploring their own spirituality as they travel through life. Others are engaged in outward treks of service. They’re all seeking to follow Christ. Get commentary series articles delivered free to your e-mail by signing up at www.CofChrist.org/subscribe.asp. Send your comments, and we may print them in the magazine. To subscribe to the Herald, visit www.HeraldHouse.org or contact Subscriptions or 1-800-767-8181. The series on Community of Christ theological foundations continues in the Herald with an article on “Covenant,” a gift of God’s grace for the blessing of human life and creation. Covenant is a foundational, scriptural, and spiritual concept that describes a primary way God defines and blesses Divine-human relationships for the sake of individuals, communities, and creation. Read the series in the Herald or sign up for the e-subscription at www.CofChrist.org/subscribe.asp to have the articles, with spiritual practices and reflection questions, delivered to your e-mail. To subscribe to the Herald, visit www.HeraldHouse.org or contact Subscriptions or 1-800-767-8181. In addition to study and discussion, the First Presidency invites your feedback. Send your responses. Estate and Financial Planning changed its name to Estate and Gift Planning in November. Members over age 50 in the USA and Canada will receive a mailing from Estate and Gift Planning notifying them of the new name. The mailing includes a letter, magnet, and business reply card. It outlines the comprehensive services offered by Estate and Gift Planning and encourages members to learn more about the services offered by the team by calling 1-800-884-7526 or by e-mail. ‘Tis the season…for colds and flu…But are you confused about whether the runny nose, cough, or sneeze is a serious problem or just a nuisance? The latest health brief from Community of Christ Health Ministries Association gives a guide to differences between colds, flu, and allergies, as well as recommendations for prevention and treatment. “He that hath clean hands, and a pure heart…shall receive the blessing from the Lord…” Psalms 24:4-5. Even thousands of years ago, spiritual wisdom told us that health habits affect quality of life and the human spirit. Get this health brief at www.chm.hmaCofChrist.org. Register now for MEADS (Ministerial Education and Discipleship Studies). Classes offered February 4–8 at the Temple in Independence, Missouri, will be: Community of Christ Theology from 8:30 a.m. to noon with Apostle Dale Luffman, and Community of Christ History from 1:30 to 5:00 p.m. with World Church Historian and Archivist Mark Scherer. Cost is $88 per course or $175 for both. It’s only $50per class to audit. For more information and syllabi, go to www.CofChrist.org/meads/schedule.asp. Registration deadline is January 21, 2013. Contact Michelle Booth (ext. 1459) to register. Register now for Interpersonal Peacebuilding and receive Temple School credit. February 4–8, 2013, this course will be offered with Sandee Gamet, Peacebuilding Ministries, from 8:30 a.m. to noon for $35. For more information and the syllabus, go to www.CofChrist.org/meads/schedule.asp. Registration deadline is January 21, 2013. Contact Michelle Booth (ext. 1459) to register. Register now for FOCCUS (Facilitating Open Couple Communication, Understanding, and Study). Training will be facilitated by Jeri Lauren Lambert, Children and Family Ministries, on Saturday, February 9, 2013, 9:00 a.m.–4:00 p.m. at Community of Christ Temple. Cost is $70 ($50 for FOCCUS book plus $20 for course). Contact Michelle Booth (ext. 1459) to register.